If you're doing content marketing, you're probably maniacal about measuring your success. You've got to grow a business after all ... and you can't just hit "publish" on a social media update and hope that it somehow brings you traffic. You've got to investigate the numbers that matter so you can fine-tune your efforts and get the most bang for your marketing buck. And you've got to see examples of companies already hitting those numbers so you can what success looks like. Today, LinkedIn introduced two tools to help make your social media marketing a bit smarter: Content Marketing Score and Trending Content. One tool will help you measure your company's success and the other will give you insight into what successful content looks like, giving you much more context into being successful on LinkedIn than was previously available on the platform. If you're already measuring your success on LinkedIn with your marketing analytics, these tools will give you some additional LinkedIn-specific recommendations that can be coupled and tracked with your existing tools. 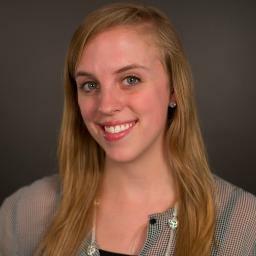 Who doesn't love more data that's actionable and specific? We took a dive into each of these tools to give you a better understanding of what they are and how you can use them in your marketing. Here's what we found. LinkedIn's new Content Marketing Score will help arm you with the data you need to help grow your company's presence on Linkedin. According to LinkedIn's announcement post, the Content Marketing Score "measures member engagement with your Sponsored Updates, Company Pages, LinkedIn Groups, employee updates, and Influencer posts (if applicable)" and ranks you against your competitors on those same traits. Competitors can mean lots of things -- you can filter your score against others in the same region, seniority, company size, job function, and industry. LinkedIn will also give you recommendations to improve your score over time. 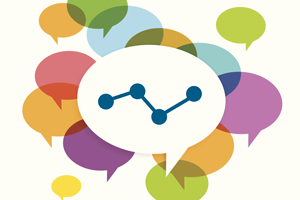 It seems like a pretty awesome update to supplement your marketing analytics. The competitor data is especially cool -- seeing who you're matched up against and how you perform against them can be eye-opening. If your company wants to take a deep dive into optimizing your LinkedIn presence, these metrics will be really helpful to getting the first step of LinkedIn right -- engaging with your followers. If you want to get the full picture of how your LinkedIn marketing drives results, you can supplement your Content Marketing Score with the rest of your marketing analytics. Want to see how you stack up? You can request your score here. To get a sneak peak of what kind of information you can get out of the Content Marketing Score, check out this infographic. Truthfully, the infographic seems to focus more on large companies, but your score should be more tailored and useful to your company, industry and competitors. Another crucial aspect of developing an inbound marketing strategy is knowing what's going on in your industry. You've got to know what the hot-button issues are if you plan on creating compelling, traffic- and lead-generating content. 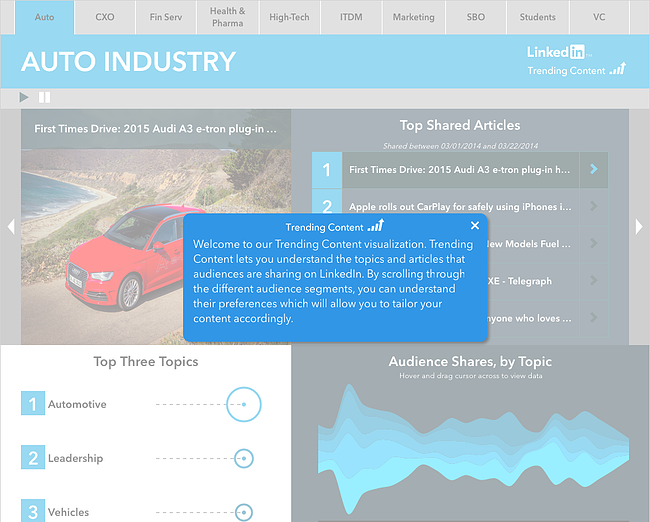 You probably already have an RSS feed or bookmarks set up of top sites to get news from -- LinkedIn's Trending Content tool is one to add to your industry monitoring list. This interactive tool surfaces the most popular content on LinkedIn for each different audience and topic segment: automotive, executive, financial services, health and pharmaceuticals, high-tech, IT, marketing, small businesses, students, and venture capitalists. Pick your segment and you can see top shared articles and topics on LinkedIn from around the web -- not just posts from the Influencers Channel. I'm looking forward to using this tool to get content inspiration for blog posts -- and if I were running HubSpot's social accounts, I'd use it to find engaging content to share on LinkedIn and other social networks. Seeing examples of high-performing content on LinkedIn can go a long way to help you create your own engaging content for LinkedIn's audience. Since this just launched today, I'm not sure how often the trending content is updated -- but if it's often, this tool could be a goldmine for content ideas and social sharing. Since these tools are so brand new, we'll see how we actually end up using them ... but on the surface, they look to have pretty valuable information that can supplement the rest of your marketing activities. Try them out for yourself -- who knows, next month, your LinkedIn Content Marketing Score could skyrocket. If your other metrics follow suit, you know you've got to keep using these tools.